BRITISH EMPIRE & FOREIGN COUNTRIES was a three session sale beginning on the afternoon of Tuesday 4th June and, after the customary well-supported section of Miscellaneous & Mixed Lots, one early lot to catch the eye was the pair of King George V master die proofs on pieces from the De La Rue archives (lot 91) which rose to £12,642 (est. £6,000-£8,000). This remarkable pair, the first being from Die I and the second from Die II, demonstrates the transition between the Dies that occurred during the use of Plate 10. The auction included a number of interesting and unusual country sections including the collection of Guadeloupe formed by the late Tony Shepherd and fine Samoa. 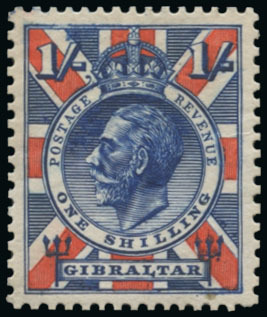 A strong section of Gibraltar featured material from the exceptional Moore & Moore collection, including one of just four known examples of the King George V ‘Union Jack Essay’ (lot 434, above), appearing on the front cover and selling for an impressive £6,084. Never previously offered in such depth and quality in a major auction, the fascinating collection of Biafra formed by the late Dudley Prestedge achieved a fine total of £23,418 with all lots sold. 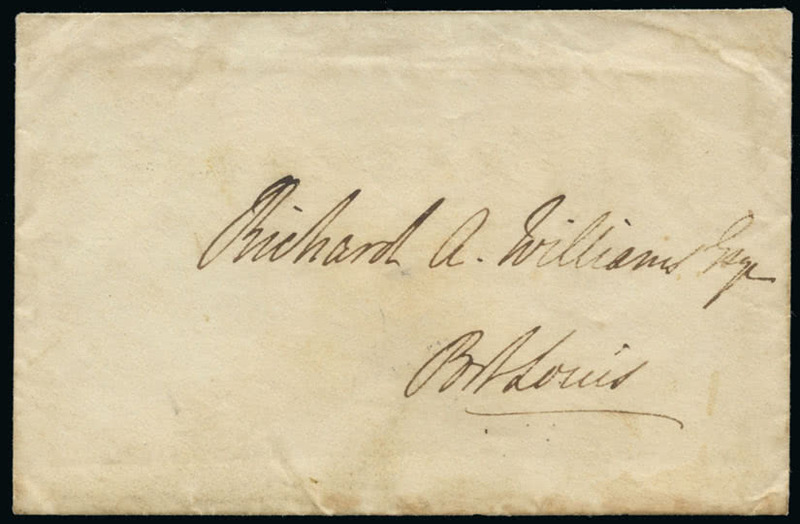 The concluding session of this auction comprised a further notable offering of Falkland Islands & Antarctica that opened with a small group of recently discovered early letters. A letter from Governor Moody, handcarried from Port Stanley in Port Louis in 1847 and now recorded as the earliest item of internal Falklands mail (lot 1190) achieved £4,013. 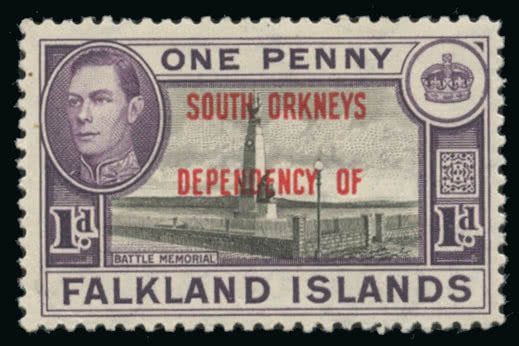 The Tony Belfield collection of the 1944-45 Overprints for the Falkland Islands Dependencies received a warm response. 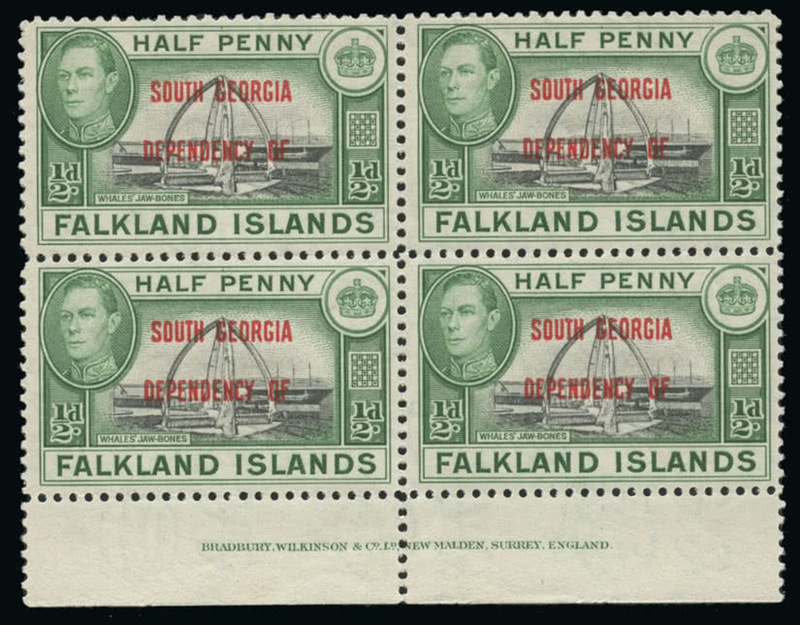 Among notable results, the unique imprint block of four of the South Georgia 1/2d. watermark sideways (lot 1380) realised £9,391, whilst a mint example of the South Orkneys 1d. 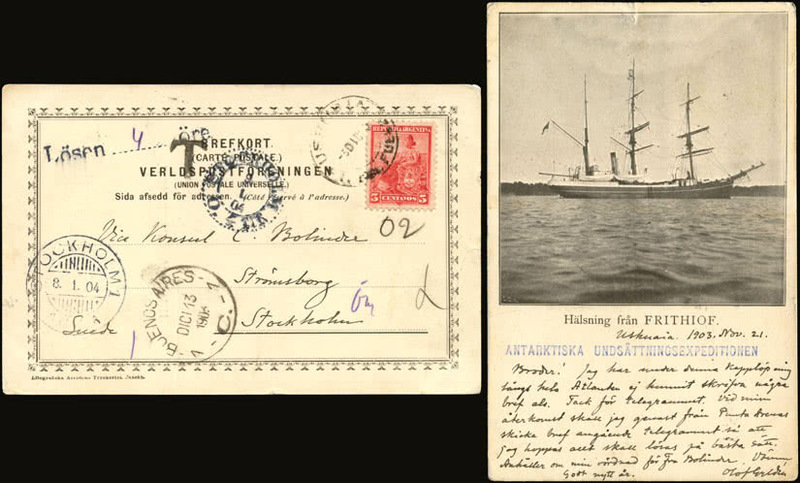 with watermark inverted (lot 1381, left), one of three known examples, rose to £3,492. Antarctica saw some strongly competitive bidding and high prices. 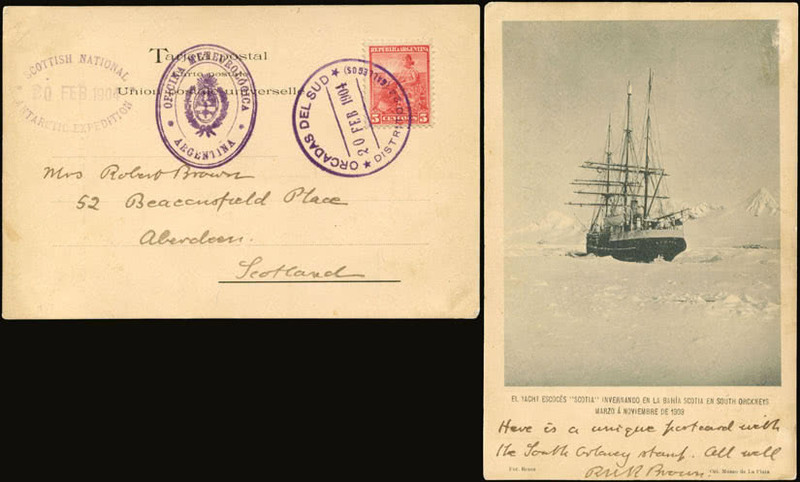 A postcard of the ship Frijthiof sent by Olof Gylden, leader of the 1903 Swedish Relief Mission (lot 1433) rose to £7,465 whilst one of the Scotia sent in 1904 from the South Orkneys by Robert Rudmose-Brown, botanist to the Scottish National Antarctic Expedition (lot 1464) climbed to £6,261. THE JOHN DAHL COLLECTION OF THE REVENUES OF PORTUGAL & COLONIES received a disappointing response, suggesting that the market is not yet ready for an offering of revenues presented in such detail and depth. 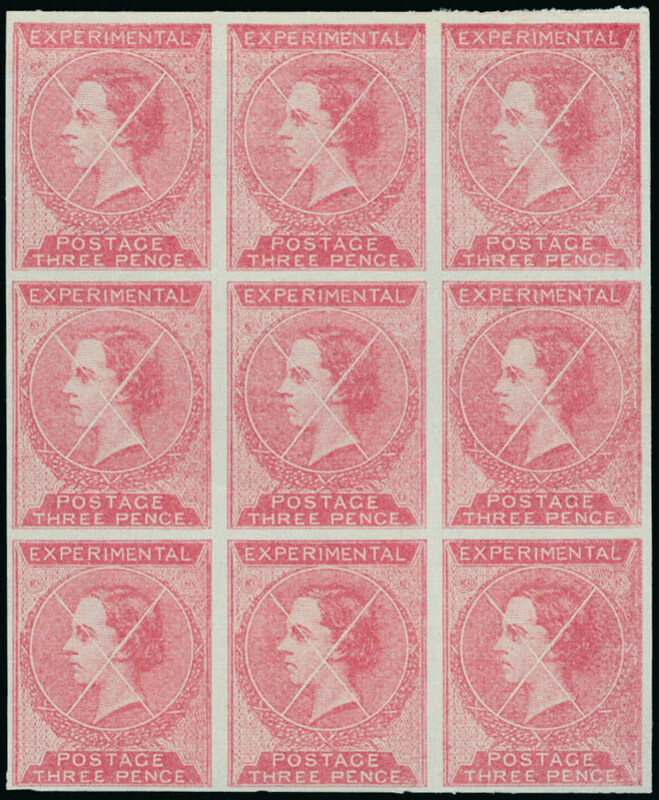 Top price paid was for the font cover item, the 1861 De La Rue Experimental Postage essay in a sheetlet of nine printed in red (lot 2004) which sold for £1,806. A few of the Portuguese colonies bucked the overall trend, most notably, but not surprisingly, Macao. THE APOLLONIA COLLECTIONS OF NORTH BORNEO, LABUAN, BRUNEI & SARAWAK were well received, attracting enthusiastic bidding from around the world that filled the auctioneer’s book. Among the notable prices achieved, £10,836 was paid for the rare full strip of ten of the Brunei 1906 Labuan overprint 2c. on 8c. incorporating the surcharge double and “TWO CENTS” omitted errors (lot 3016). 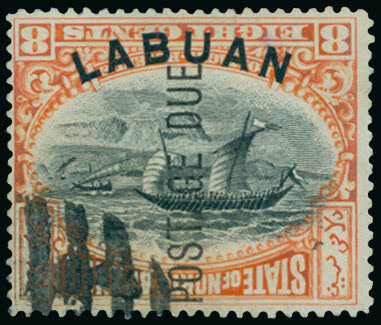 The attractive inverted frame variety on the Labuan 1901 postage due 8c. 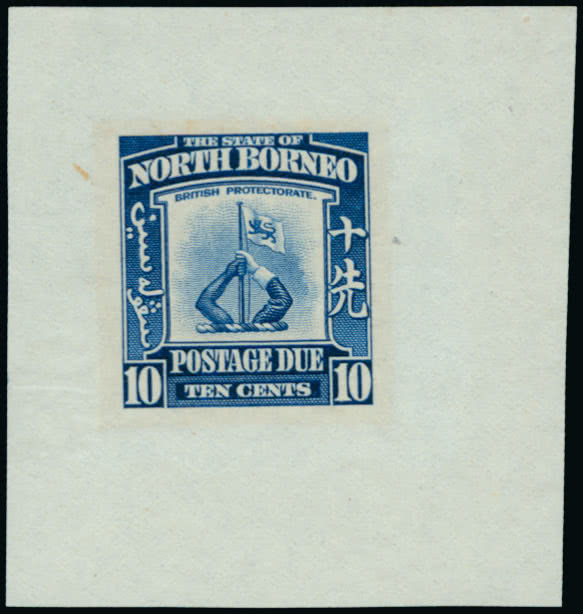 cancelled-to-order (lot 3119, left) rose to £4,212 and a set of five imperforate proofs of the North Borneo 1939 postage dues in their issued colours (lot 3310) rose to £4,680.